Even though it was completely covered by a silver tarp, I could see that it was a Porsche. The unmistakable shape of the 911 cannot be disguised by a covering of any kind. It was just outside of one of those corrugated farm buildings with the round roof like a campbell's soup can cut in half lengthwise. It was in the most unlikely of places in the countryside, where you would not expect to find anything not made in the USA. In fact, a vehicle not in the pickup category or the farm vehicle category was rare in this particular area. It was not there last week, that's for sure. I would have noticed because I drove this route to work a few times per week, and even in spirited fashion, I would have noticed. On this morning, I was already a few minutes late, and although I momentarily took my foot off the gas contemplating a stop, I put it back on just as quickly. I would stop on the way home. It was in the same place on the way home, and I pulled into the gravel yard beside a nicely kept farmhouse. A guy I estimated to be in his mid-fifties appeared from behind the house. I asked about the car and he said that it was his son's car and it was not for sale. I asked if I could take a look at it anyway since I was a fan of those cars. He agreed and I pulled off the tarp to reveal a 912, not an early 911 as I had thought. The red paint was badly faded, there was some surface rust, and the sun had done a number on the tops of the seats, but it was all there. The engine compartment looked great, and Bill said that it started right up every time. It turns out that it had been stored for a year in the building, but they needed room for a big tractor so it had to live outside temporarily. I suggested that it was a good car and that finding a place inside one of the buildings would help keep it that way. Bill said his son would be back from Georgia to pick it up at Thanksgiving. I left him my card and said if his son ever decided to sell, to give me a ring. A few weeks later, the car had not moved. Heavy rain had splattered the bottom of the wheels and the hubcaps with mud. I was tempted to stop again and offer to at least get it off the ground, but decided against it. Another month brought Thanksgiving, and I drove that route daily in the hopes of seeing a car with Georgia plates, or the car gone. Neither happened. A few weeks later I stopped by. Bill said his son had to work over Thanksgiving and would be up for New Year's. He said he had mentioned my visit, but the car was not for sale. I took Bill's phone number. I was away for new year's, but the car was still in the same place when I returned. I waited a few weeks and then called. Bill said his son had no where to keep it in Georgia but was moving in the spring and would pick it up then. I vowed not to drive that way anymore. In the late spring I drove by one day and it was gone. I was actually pleased until on the way home I saw that it was now just moved beside another building. I called Bill. He said he was glad I called because he had lost the card and his son wanted to speak with me. I called and he seemed like a nice guy, but he wanted ridiculous money at the time for a 912 in good shape, much less his car. I suggested that he check Panorama (the Porsche club magazine), and a few other sources for comparative prices and get back to me. He didn't. The car sat outside and deteriorated. That fall, I stopped by again. I asked Bill if I could help him get it up off the ground and tie down the corner of the tarp that was flapping in the wind. He said he would do me one better and move it inside the building now that he had someone to help. When we got to the car, the front bumper was tweaked upward and I could see why. Bill had just hooked his John Deere and chain up to the bumper and pulled the car around the back. He said it would not start anymore. Inside was evidence that it had become a mouse hotel. I helped Bill push it inside the building, which was only marginally better than outside. We pushed it up onto some plywood to keep it off the dirt. He said he told his son to sell it to me, but that his son did not want to “give it away”. I left and smoldered for the rest of the ride home. I vowed not to drive that way anymore. The next day I called Paul (the son). I offered him a good price, higher than I wanted to pay, but certainly fair. He said he could get 3 grand more in a heartbeat. I asked if he had seen the car lately. He said he would think about it. He didn't. With the car out of sight, it was a little easier to drive that route from time to time. Wondering is better than knowing. A few more seasons passed and I changed jobs. This meant that I only drove that way when out driving or riding around for pleasure. I could have stopped by since Bill and I were now good pals united against his son, but I really didn't want to see the car. It would be like visiting an old relative in the hospital when you really want to remember them as the vibrant cool uncle that they were when you were a kid. I vowed not to drive that way anymore. Then one day months later, Paul called. He would agree to my price. I told him that the price was no longer valid, but that I would get back to him. At the house, Bill greeted me warmly, and told me that his son needed some money and that he had softened him up. We went to look at the car and it was sad and criminal. At some point, the tarp had been removed. Bats or Owls or some animal that secretes acid had used the body as a toilet. Chrome was pitted, the wheels were a few inches into the dirt, and seals crumbled to the touch. The mice had moved out of the interior because raccoons (or perhaps Baboons) had moved in. It was a mess, and I was astonished at how much deterioration had taken place. It was not quite a parts car, but it was pretty close. I called Paul and told him that it was worth almost nothing, but that I would give him parts car money for it. He said he would sleep on it. He didn't. I vowed not to drive that way anymore. It has always been perplexing to me that some people would rather see a vehicle disintegrate into dust rather than let it go (at a reasonable price) to someone who wants to maintain and enjoy it. 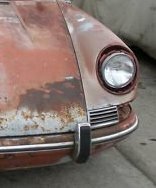 How many times have you heard someone say “nah, I'm gonna restore it”, only to see it carted off as scrap metal years later. How many jewels are disintegrating under tarps right now ? How many never-to-be-finished projects are getting pushed further and further into the back of the garage/shed/barn ? How many viable vintage cars have senselessly become parts cars like this one ? I can't be positive of the fate of that Porsche 912, but I'm pretty sure that it rotted into the ground right there in the out building. 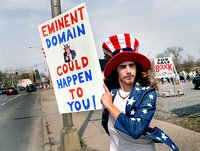 It seems to me that at some point, I should have been able to go to the courthouse, exercise my right of eminent domain, and legally apropriate that vehicle for fair market value. Its in the classic vehicle constitution, and its the right thing to do.